Apologies as I have no photos for this post. Tragic, I know. Crawling along in tortoise speed traffic, I was trying to get on the exit ramp to I-10 as a big semi truck was trying to get into my lane. The whole front of the truck was covered in ice. Gee whiz, I thought, did this guy just drive here from Canada or something? Two hours later, the front of my car would be similarly covered. After the two hour drive, I arrived at Camp Eagle in Rocksprings. The weather was cold, wet, and miserable. And soon enough, I’d be running 50 miles in it. That evening there was a nice pasta dinner. I was hungry and the food was surprisingly tasty so I had two huge plates. The brownies were especially awesome, I had three of those! I stayed in a dorm with 5 other runners. Before lights out, my friend Julie joked she was in trouble if anyone snored because she had only one earplug. And wouldn’t you know it, one of our runners did snore. LOUDLY. It seemed to get louder with each breath until he gasped or moved and the snoring finally stopped…. until a few minutes later when the cycle restarted. I have a hard time falling asleep as it is, so this was just torture. The worst part was the fact that he knew he snored but didn’t warn us. He offered a limp apology the next morning. As such, he is now on my list of non-approved bunk mates. It was cold and misty, but at least it wasn’t raining. However there was ice everywhere. The ice made for very slippery footing. The loose rocks were like oiled marbles. Going up hills was really frustrating; much of the first lap was an exercise in patience and curse words. Later, I put that practice cursing to use. I was running along, and came up to a wooden bridge I had to cross. I stepped on the landing, slipped, and dead chickened, landing flat on my right side. I lay there for a second, blinking. I was literally and figuratively stunned. I had just totally wiped out. My wrist sort of hurt, but otherwise, I seemed to be okay. I got up slowly and gingerly made my way across the bridge, which was coated in ice a quarter inch thick. I could have skated across. Safe on the other side, I found a new respect for those highway signs that say BRIDGE MAY ICE IN COLD WEATHER. 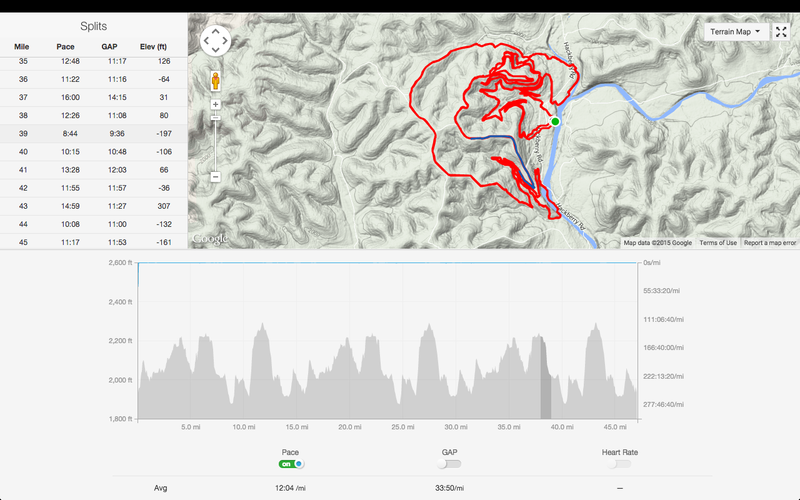 During the second loop, I came into the aid station that we hit twice per loop. Chris (from my running group) says, “Cara was bummed she didn’t catch up to you. She wanted to run with you for a bit.” Half joking and half serious I said, “Cara’s not going to catch up to me!” Cara’s a strong runner, but I know I’m faster than her. I’m feeling low energy, so she takes over the lead. We run together and chat for a few miles. I tell her what I’d said to Chris, (lest she hear it from him first.) When we get to the aid station, I say ,”Hey Chris, look who caught up to me!” It was pretty amusing, we all had a good laugh. Leaving the aid station, my energy levels had picked up. I took over the lead and eventually dropped Cara. She would finish only 4 minutes behind me, placing First Female in the 50M. And the last strong runner was a dude named Dana. This guy and I had been leapfrogging for the second and third lap. He would slowly but consistently jog up the hills and pass me as I hiked. Then later on the flats, I would bomb past him. We traded back and forth like this at least 8 times. Every time I passed him, I hoped he would stay passed. But when I’d stop at an aid station, it would be just a few seconds later and he’d come trotting into view. I kept thinking of that scene in the Terminator movie where the bad metal cop guy turns his arm into spikes and he stabs the trunk of the car and they can’t shake him. Yeah, that was the guy following me. While we didn’t exactly chat, we did speak to each other. We were both running our own race, neither of us were concerned about “winning” the duel. Sure, I would have liked to have finished one place better, but it wasn’t that big of a deal. The whole back and forth was rather comical. Coming into the final few miles, I was ahead of Dana, but running out of gas. I knew there was a small hill coming, so I stopped and waited for him. I told him I knew he was going to pass me, so go ahead. He finished 3 minutes before me, placing Overall Fifth in the 50M. I crossed the finish in 9:21:02, placing Overall Sixth. Dana came up to me and shook my hand and gave me a bro hug. Since he’s a local, I’m sure I’ll see him at another race. **DO NOT ROOM WITH PEOPLE WHO SNORE. You might say use earplugs, but then how do you hear your alarm? **GIRLS ARE FAST. Also, I am not as fast as I think I am. **BE ALERT, ICE CAN BE DANGEROUS. We don’t encounter ice very often on our trails in Texas, so when the conditions are right for ice, pay attention. This is even more important while driving. **SOMETIMES IT’S MORE ABOUT THE PEOPLE RUNNING THE RACE THAN THE RACE ITSELF.